(This picture is of me alone. I was threatened with you tube revenge if I posted anyone else up. Hodmandod Major claims to have footage of me singing along to my ipod. I don't remember this, but just to be on the safe side I thought it better not to risk it). Good-bye then 2006. In the end you turned out to be a good year - much better than 2005... which I would like to bury away in the ground and leave there. but most of all I have this blog. Sometimes I think I should give it up because something I love so much cannot be good for me and it takes up so much of my time I really should be doing something else. But I find out so many interesting things and contact so many interesting people I cannot let it go. It enriches my life. I feel I know people across the world and it makes me aware more than ever than the world turns - than the sun shines on one part and then the next - that I am never alone and I hope this never changes. Yes, 2006 was good because of all the people I already know and the people I met - Oxford, Amsterdam, Lampeter, Languedoc and the web. If any of you read this THANK YOU and Happy New Year to you all. "Success teaches you nothing. Failures teach you everything...Making mistakes is the most important thing you can do." Which is very similar to a comment somone (Susan Balée, I think) made on this blog recently. I think I shall try to use it as my guiding principle for 2007. Just recently I have found that whenever I close my eyes the real world around me grows distant and a fictitious world takes over. It is not a concrete world - just a swirling mass of assumptions and a vague knowledge of incidents that have not really happened. When I open my eyes these thoughts remain with me but I know now that they are false. This is happening with greater and greater frequency. Does this happen to anyone else, I wonder. Or am I just going mad? Following on from my last post I did a little research. This article from the National Geographic is particularly interesting. It seems that in China there are often, but not always, pre-shocks and this is what the snakes - and other animals - are thought to sense. For instance pigeons have nerve cells in their legs which are highly sensitive to movement and it is thought that it is these that provide a trigger for their general skittishness when an earthquake is imminent. But there must be more to it than that - I'm pretty sure there have been sensitive seisometers detecting earth shivers for many years. There is also evidence that there are changes in the local magnetic field, or maybe a slight change in the chemical composition of the air as gases from beneath the earth's crust are released. But of course animals react to other stimuli besides earthquakes and not all earthquakes have pre-shocks so scientists are trying to develop artifical sensors based on whatever methods animals use to predict earthquakes . Apparently they have not yet had a huge amount of success in their mimicry - some biological systems have evolved to do their job so extraordinarily well, it seems. One author, the biologist and author Rupert Sheldrake (whom Salon calls 'a delightful crackpot'), has approached this problem in another way which, on the face of it, makes ideal use of something that humans have succeeded wonderfully in inventing - the internet. He proposes that a website logs records of unusual animal activity in earthquake-prone zones (like Susan and CB's ring of fire in comments below) and if there are enough reports and other activity can be ruled out then this would make an effective early-warning system. The fact that the reports come from many observers might help prevent false alarms. A similar sort of idea has worked in China. In 1975 the behaviour of animals and various geophysical evidence was used to predict an earthquake in a province in China in 1975 which helped save thousands of lives. The trouble is the system also predicted earthquakes that didn't happen and also did not predict a dreadfully destructive one that did a year later. Prediction of earthquakes then is a complicated business. I suppose it faces the same problems as those people responsible for predicting terrorist attacks: there are always going to be false alarms and the real and vital skill is ascertaining which one (of the many) is real. On Boxing Day there was an earthquake in Scotland and another near Taiwan. It is as if the earth is following our calendar and periodically feeling the need to shift. I feel convinced there was one last year on the 26th, and of course the year before that there was the dreadful Tsunami. Just a coincidence, I know, but a little strange. I have often wondered what it would be like to be in an earthquake and a couple of years ago I felt a slight earth tremor in the night. I was just drifting off to sleep when I had the sudden and definite sensation that I was moving sideways. I woke properly and heard Hodmandod Major coming out of the bathroom so i got up and spoke to him. He seemed to know exactly what it was - apparently the doors of the bathroom cabinet had juddered for a few seconds. That was it my unspectacular experience of an earthquake. It was probably something fractional on the Richter scale but my curiosity was satiated. That was quite interesting enough. I read this morning from a Reuters report (I shan't bother linking - Reuters' addresses are so long the links never work) that people in China know that snakes can predict earthquakes. Before an earthquake sleeping snakes wake in their nests and squirm away in such a panic that they hit their heads against walls. I wonder if this is for all sorts of earthquakes or just some and why the snakes wake. Do they feel the earth more than we do? There must be something they can sense that we cannot. Fascinating stuff. Democritus and the January Sales. I am slowly returning to my books. At the moment I am reading THE RIVALS by Michael White. 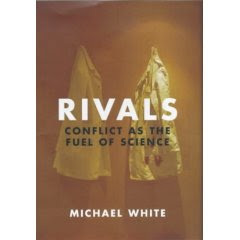 This is a very interesting book about rivalry in science and extremely well-written. The introduction took me on a rapid journey through the birth of science and introduced me to a man called Democritus who died in 370 BC. He had an atomic view of matter. Nothing, he said, is ever made from nothing - which must be a way of stating the conservation of mass. Unfortunately the ideas of two slightly later Greek philosophers, Plato and Aristotle, were more influential. Their semi-mystical and egoistical idea that man was at the centre of everything held back scientific thought for a couple of millennia. The church found that Aristotle's ideas blended comfortably with their own and consequently anyone like da Vinci, Copernicus or Galileo who were inquisitive and tried to find better explanations of how the world worked had to be careful otherwise they would be dubbed heretical and, like Bruno in 1600, condemned to death. It was only at the beginning of the twentieth century that Democritus's ideas were revisited. Everything is formed from atomic collisions, Democritus said, and everything is interrelated. His ideas seem astonishingly modern and I keep wondering why he is not better known. This interrelation between everything that happens I find quite haunting. 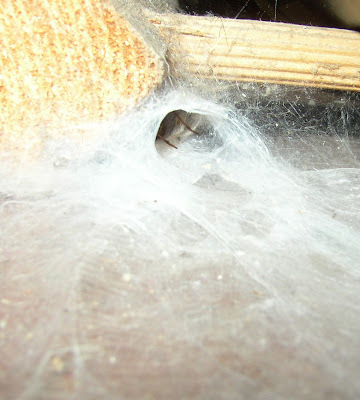 It is as if the universe is diffused with something like spider web and everything we do, everything that happens, sets the spider web vibrating in a new and unique way. Every breath, every movement causes the world to change. Most of the time it is just slight and inconsequential, but just occasionally I suppose it can be catastrophic. Today, for instance, I got up early for the sales. It was strange shopping before dawn. 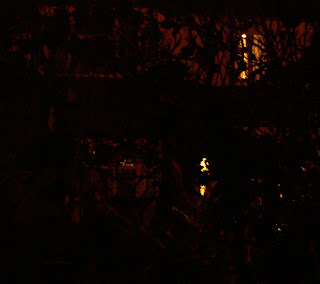 At 8am there were already people waiting - huddling around doorways in the dark, just their faces lit by the Christmas decorations still twinkling inside the shops. I thought of Democritus's atoms. For about ten minutes we waited, the numbers slowly swelling, and a rough queue forming down the road in front of the main shops; while on the other side of the big glass doors the security guards stood, as if watching for a signal, then finally throwing switches to allow the automatic doors to open. The we surged in together. All of us together can strip a shop. All of us acting together can warm a planet. Small individual changes make big global changes. We are like Democritus's atoms changing everything around us. It is at the same time humbling and terrifying. Maxine's post on favourite Christmas books set me off on a nostalgic trip. 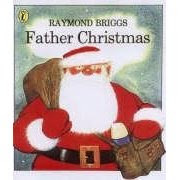 The first book that came to mind was Raymond Brigg's excellent FATHER CHRISTMAS which Hodmandod Senior would read to the Hodmandods Major and Minor in years gone by in an attempt to settle them off to sleep on Christmas Eve. 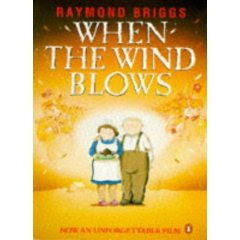 Now Raymond Briggs is a favourite author of mine - I think we share the same pessimistic view on life. In Raymond Brigg's picture book (or should I call it graphic novel) Father Christmas regards the big day as a chore (which it is). He goes to the toilet, feeds the reindeer, suffers various inconveniences delivering Christmas presents down chimneys but best of all calls it 'bloomin' Christmas' which is as close to swearing as he can get since this is a book for young children...and not so young children. 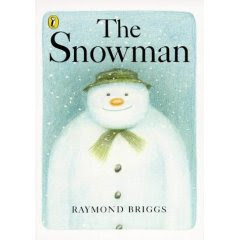 Actually, thinking about it, the gloomy Raymond has done rather well out of Christmas - not only writing the definitive version of Father Christmas's activities (as far as the Hodmandods are concerned at least) but also responsible for the poignant story of the SNOWMAN. The TV version of course now seems to be a compulsory feature of TV schedules. It made Hodmandod Senior cry the first time he saw it - big softy that he is - which impressed and fascinated me very much. 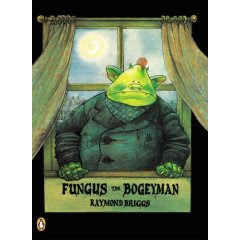 Raymond Briggs also wrote FUNGUS THE BOGEYMAN which was a cult classic when I was a student - another excellent book. 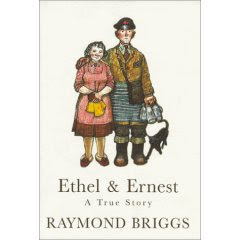 I also liked his book on the Falklands war, THE TIN POT GENERAL AND THE OLD IRON WOMAN, ETHEL AND EARNEST his book on his parents, and especially liked his book on the after effects of a nuclear strike WHEN THE WIND BLOWS. Ah yes, Raymond Briggs is my sort of author. I would love to meet him in a pub and exchange cheerless anecdotes. However returning to Christmas... When I was a child my parents, my brothers and I used to go to the Leicester Welsh Society. This was, as you might guess, a society for displaced Welsh people who were being oppressed by the evil English (by being sniggered at behind their backs - a cruelty which I suspect persists to this day). Once a week, or month. or when they felt like it, the Welsh immigrants of Leicester would congregate in a hall to huddle together, speak Welsh (or English with a strong Welsh accent), sing Welsh hymns and eat Welsh cuisine (a frankly unimpressive combination of lamb, potato soup and fruit cake). There were the north Walians (who were sometimes even more evil than the English and spoke a Welsh that was similar to the Welsh that everyone else spoke but had strange words for innocuous things like grandmother), and the south Walians who were perfect in every respect and spoke the proper language of heaven. There was also, in January, the Christmas party. For this I was required to dress up in a party dress (which I enjoyed because I was that sort of sad little child that craved attention). However, the highlight of the Leicester Welsh Society Christmas Party was the reading out of A CHILD'S CHRISTMAS IN WALES by Dylan Thomas which would be listened to very critically because it was very important. The Welsh take reading, writing and singing very seriously. We had our own edition of Dylan Thomas's work at home and it was one of my mother's most cherished pieces of literature. I remember my parents reading it out to each other and nodding - yes, that's exactly how it was, we were just the same - though obviously my mother had greater credibility in this since she was born and raised in Swansea. I heard that narrative so often that I know parts of it by heart - and even though I suppose I might have expected it to have been spoilt by familiarity I find that it wasn't. When I hear it now I love it just as much. The words take me back to sitting stiffly upright amongst all those Welsh voices in that peculiar society and I feel oddly at home. 1. 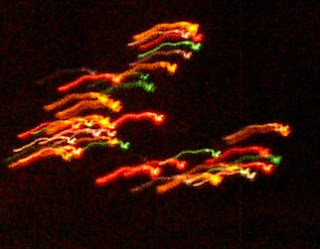 The energetic Skintwriter is now running a reader's choice for his short story competition. 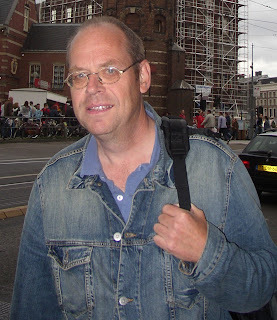 Congratulations to J T Ahearn for his short story SNOW which was the combined choice of the judges Maxine, Debi, Minx and Skint and myself although there were others we all liked very much too. 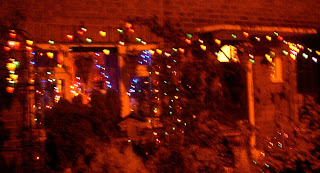 Skint has links to all - so please take a look if you feel like some entertainment this Christmas. 2. Thanks to Dave Lull I have discovered some poetry I love. They are by Michael Creagan who, like the Welsh poet Dannie Abse, also has a day job as a doctor. 3. On the subject of poetry Twitches continues to impress me much. 4. Chief Biscuit and Jan each have charming posts about Christmas and childhood. 6. ...and finally, my American editor at Viking emailed me the other night to say he was was pleased to see this interview with moi in the on-line version of the magazine Rain Taxi by multi-award winning writer Jeff Vandermeer (author of the fantastic SHRIEK (Amazon.com's and San Francisco Chronicle's best of year fantasy in 2006)) and his valiant wife Ann. Thanks to both of you for taking so much trouble. Hodmandod Major has found a job. It has taken several months since graduating in the summer. It is hard these days. But he has a job in Manchester so he will be leaving home. Finally, absolutely, leaving home. No longer a student coming home in the vacations but a man with his own place away from here. He will be gone and everything will change. I am glad because it is the natural order of things. Children leave home and it is right that they do. They move away, become independent and I would wish nothing else for him. But he will be gone. Just three places at the table. It will take some time for us all to get used to this. 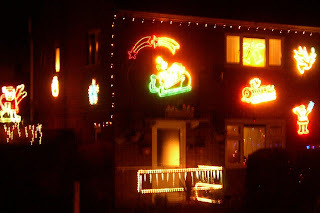 Tonight, while Hodmandod Senior was visiting his mother, I wandered around the streets of the village delivering Christmas cards to people I know. sometimes pulsating in different sequences, sometimes outlining every apex in a cool bright glory. Hodmandod Senior grumbles. He likes to look at the stars. It is a treat to him to go to some remote spot unpolluted by light so he can properly see the constellations. Sometimes we sit on the wooden bench outside our back door waiting for meteors - brief sparks in the sky that disappear so quickly I wonder if I have really seen them at all. Once we saw the moon encircled by an iridescent halo and for several nights we saw a comet hovering above us - seemingly still but obviously moving - its tail stretched out behind it and we congratulated ourselves on our luck. But tonight there was just this: man's homage to mid-winter. No energy-saving light-bulbs here. For a twelfth of the year the planet is ablaze with the highest wattage available. 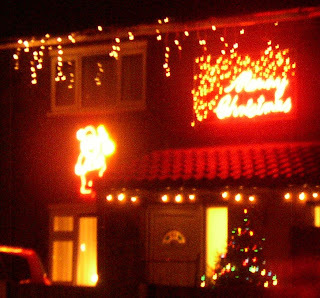 From the first of December when they are switched on until the evening of the 6th January when they are switched off and no doubt lovingly returned to their box. I believe that some houses are in competition. 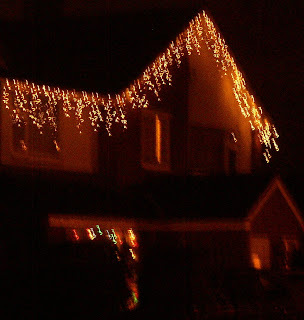 Their lights blare at each other across the street, one loud decorative addition following another, year upon year until all sides of the house are covered. while others swathe everything in colour. For some it seems to be a declaration of happiness and defiance. 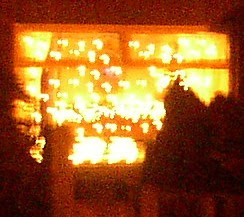 In this house a daughter was lost in her prime, and blindness threatens - but every year their lights become brighter. Christmas will be merry, they seem to be saying between gritted teeth. Despite everything. which meant that above it I could see the sky. There were no comets, no halos, no shooting stars. There was just the indigo sky and the unsophisticated pale blue of clouds - each one lit by the light of a sun that had recently disappeared beyond the curve of horizon. For a while I just stood and thought about the sun still shining from somewhere I couldn't see and yet still managing to pick out these clouds above my head - and it seemed so extraordinary and beautiful that for a few moments it was all that seemed to matter. Every day a photographer found that she passed by the same people in the street without speaking to them or attempting to know them. She gradually became curious about them and eventually garnered enough courage to ask them a little about their lives and took photographs. It reminds me of when I used to walk my children to school. Every morning a woman would always ride her bike (rather awkwardly in a tight knee-length skirt) on the pavement alongside us. I never spoke to her but eventually I felt I knew her. Unconsciously I would find myself making up tales about where she lived and what she did - piecing together fragments of sightings of her into what was probably a completely fictitious life. On odd occasions I see her still - even though five years have passed since I last accompanied Hodmandod Minor along the road to school. She still cycles the same way and is little changed. I still don't know her name or where she works - and really I think I would prefer not to know - sometimes it is interesting to preserve a little mystery. 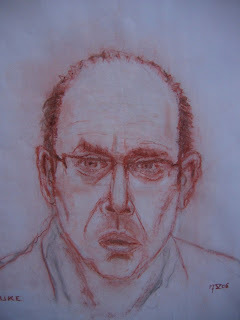 Since I no longer have a regular routine any more there are few people I see in such a habitual way. In fact I can think of only one man: a man that sings about God's love in the middle of the square outside the town hall. His voice is so obviously outrageously happy that I think he must be either insane or really in possession of a wonderful secret. Sometimes I think I would like to know what it is. 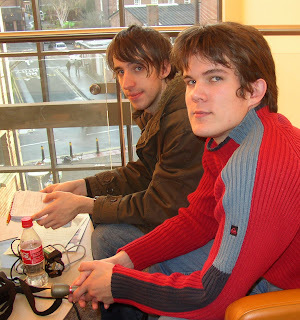 Yesterday I was interviewed by these two young gentlemen at the University of Chester - Sam Walker and Tom Glover. I imagine their ancestors making gloves or walking from town to town. What would they make of how these descendents of theirs pass their time, I wonder - studying the media. They asked me what I thought of the Chester Literature Festival. A fine thing, I told them, with lots of interest, and listed all I had seen. Then they asked me about the talks I had given and how the Chester Literature Festival had compared to the other Literature Festivals I had attended. I find it an interesting topic. The Chester Festival is small but growing, and this year all the talks were very well attended. It is much smaller than those at places like Cheltenham of course, but for its size I think it does very well. The variety of talks this year were excellent - although there were few novelists. But then unless a novelist is well-known they will not attract an audience in this country. So maybe it is better to concentrate mainly on non-fiction topics which are of interest to many - like global warming and evolutionary theory. It was supposed to be a 'radio interview' that will not be aired but will be part of their second year course. They were a lot less nerve-wracking than Jenni Murray. It was an enjoyable half hour and I think they did a good job. We are gradually changing all our light bulbs (except the ones in the kitchen) to those low energy ones. However their light seems somewhat dimmer than the ordinary bulb, or at least seem to take time to warm up to optimum brightness. In consequence I am feeling low energy too. The hours of daylight seem too short before I am once again plunged into twilight. Apart from that it has been a tiring week with little time to do much posting on this blog or indeed look at anyone else's posting - which I have missed. After my customary aerobics session, Monday was spent writing a book proposal and a host of other little tasks like correcting proofs and housework; Tuesday I swapped aerobics for an hour on an exercise bike, finished the first draft of my proposal then I met a friend in a pub and talked until too late in the night; Wednesday I set off early for London arriving at 9.30am having gone through half the entries for Skint's short story competition on the train, then spent a frankly wonderful day in the library followed by an equally excellent party in the west end; then the next day spent another day at the British Library, tearing myself very reluctantly to catch the train back home (and the rest of Skint's competition stories) then today...somehow, today, everything has come to a halt. I went to aerobics and sent off my BAFAB to Australia then shoved some clothes into the washing machine... and all the rest of the day I seem to have just sat at this desk and accomplished precisely nothing. How does this happen? Some days seem to be filled with useful activities and accomplishments; while on other days I just seem to exist. It frustrates me. I look around me and blame the light. Then open my diary and make a list and hope that tomorrow will be better. At the moment I am reading a book published by the University of Kansas Press in 1965. I first looked for this book a couple of years ago and had given up ever finding a copy, but last time I looked on Abebooks a Wisconsin bookshop claimed to have one, so I sent an email and within a few weeks it arrived at my door. Sometimes I think of its journey. It still seems like a small miracle. It is marvellous to me that a book that has presumably been lying in a bookshop for many years forgotten and unregarded now lies open on my desk. I am decidedly grateful. The book is nearly pristine; just the edges of the dustjacket slightly frayed, the pages still bright and clean. There is no mark, little indication that anyone else has thumbed these pages before me. When I read it I feel for that moment that it is my most precious possession - a ridiculous thought - but I am so overwhelminglingly pleased to have it in front of me now. What did she do? She telephoned. (I know that because the box is ticked - which means she hadn't 'called to see you',or any of the other six possibilities). I imagine she breathed down the telephone in that deep cigarette-tuned voice of hers and then left a message. Maybe her bangles clicked once against the mouthpiece as she held it and whoever took the message could hear some song by the Stones playing faintly in the background. It says underneath what she said - but that would be telling too much. The best thing about telling a story is that you can end it where you please. Here is an interesting discovery. According to an article by Andy Coghlan in the New Scientist this week spindle cells have been found in the brains of whales. Spindle cells are long spindle-shaped neurons hitherto thought to occur just in the brains of humans and the great apes. They are thought to feature in 'visceral' reactions - an example is judging whether or not another individual is suffering. If these cells are part of what 'makes us human' it is unfortunate to find that we share these cells with whales because it not only makes us feel even less unique but also makes killing whales for small parts of their anatomy even more ethically problematic.